Halal hysteria: should we be concerned about religious slaughter? The Daily Mail is outraged. Each week a new story appears in the paper informing us that halal meat is being consumed, unsuspectingly, by some of the most vulnerable members of society. ‘Top British universities secretly serve halal meat to unknowing students,’ ran a headline in May. ‘British soldiers secretly fed halal food in canteens,’ screamed another. More recently, though, a line was crossed: ‘Now halal sneaks into our schools…Parents angered by move to ban sausages and replace them with ritually slaughtered meat. It’s fairly obvious why the Mail is doing this. A simple search of the keyword ‘Islam’ on its website reveals the disturbing extent of the paper’s famous obsession with Muslims. On this basis it would be easy to dismiss all concerns about halal meat as equally ridiculous yet this would be foolish. Several of the UK’S most prominent animal welfare groups have also launched nationwide campaigns seeking to end non-stun methods of slaughter by religious abattoirs. In April a government e-petition was launched by the British Veterinary Association (BVA), with the support of the RSPCA, calling for an end to non-stun slaughter. Under European law all animals must be stunned before slaughter to render them insensible to pain but exemption from pre-stunning can be granted on religious grounds. The BVA believes such exemptions should be legally removed - a position which has proven quite popular with their petition already receiving over 70,000 signatures. At first glance, however, one could be forgiven for construing this as a relatively minor issue, perhaps unworthy of so much attention. That pre-stunning is an important mechanism in ensuring farm animals feel no pain during slaughter is not in doubt. Despite claims to the contrary by some religious leaders, there is a scientific consensus that slaughter without pre-stunning causes unnecessary suffering to animals - a position supported by the Humane Slaughter Association, the Farm Animal Welfare Council, and the Federation of Veterinarians of Europe, among other groups. Yet the number of animals affected by non-stunning seems relatively small. The latest survey by the Food Standards Agency (FSA) found that while none of the animals killed by the Jewish Shechita method receive a pre-stun, they account for less than 3% of all slaughtered livestock. Furthermore almost all of the media’s attention has focused on Islamic slaughter despite the fact that 88% of animals slaughtered by the halal method are stunned before being killed. But given that such a small proportion of farm animals slaughtered in the UK are affected, how worried should consumers and those concerned with animal welfare really be? While the numbers seem high, some have questioned the extent to which the BVA has focused on this issue when there are other concerns around factory farming which affect a greater proportion of farm animals for the entire duration of their lives. Last month a campaigner seeking election to the RSPCA’s council caused controversy when she publicly described factory farming as a “holocaust going on behind closed doors.” But Blackwell says such language is unhelpful and is relatively optimistic about the general state of animal welfare in the UK. Here, the BVA’s position appears to diverge slightly from that of another important group campaigning against non-stun slaughter, Compassion in World Farming (CIWF). While CIWF agrees the law on non-stun slaughter needs to be immediately addressed, they appear far more pessimistic about the general state of animal welfare in the UK and are campaigning on a range of other issues concerning factory farming. In fact, according to Emma Slawinski, Head of Campaigns for CIWF, non-stunning may not even be the biggest problem related to halal slaughter. A new investigation by the organisation has found that halal chickens which do receive a pre-stun are electrocuted at a voltage which is significantly lower than EU requirements. The latest EU regulations which came into force in January 2013 prohibit “the use of electric currents to immobilise the animal that do not stun or kill it under controlled circumstances.” They stipulate that chickens must be stunned with a minimum electrical current of 240mAmps. 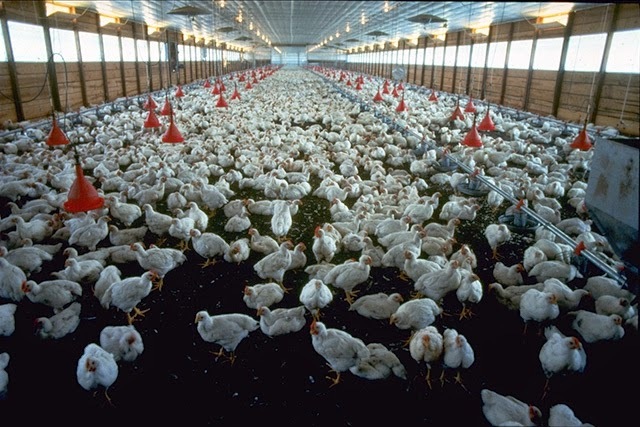 However, the current presently used for halal chickens is 40-70mAmps. “Unfortunately…the animal is receiving a painful electric shock and then being rendered unable to move but still completely able to feel and then suffering from having its throat cut as well,” says Slawinski. The EU regulations were due to be incorporated into British law through the Welfare at the Time of Killing (WATOK) bill. However, in May the Department for Environment, Food and Rural Affairs (Defra) revoked the new rules. This came just days after a judicial review was launched by the Association of Independent Meat Suppliers on behalf of 20 abattoir operators who argued that the increased current would be expensive and have the potential to kill chickens, rendering them unacceptable for halal consumption. Slawinski is keen to stress that CIWF does not regard this as a problem with religion and that they are exclusively concerned with improving animal welfare. The organisation works closely with Muslim groups and is hopeful of progress despite the setback presented by the findings of their latest investigation. Besides non-stunning and inadequate stunning they maintain that a number of laws designed to protect animal welfare are routinely breached in the UK for reasons that have nothing to do with religion. "They’re still overcrowded, they still can’t express any of their natural behaviours, they’re still standing on wire mesh floors. And those animals are in those cages for around a year and then they come out and get slaughtered," says Slawinski. Perhaps unsurprisingly, these issues tend to attract relatively little media attention compared with halal slaughter. But whilst it's crucial to ensure that animal slaughter is as painless as possible, Slawinski maintains we should also be attending to the wider needs of farm animals and the pain they suffer in their day to day existence. “Slaughter is an incredibly important issue, not least because it’s one of the issues that applies to all animals that we end up using for food," she concludes, "But really we should be concerned about the welfare conditions for farm animals through the whole of their life."